Clean crystal glasses safely in the dishwasher. Until party guests leave and the flowers begin to droop, that is. And you're left cleaning glasses with lipstick stains on the rims, and a water ring around the vase. Here's how to clean crystal and your everyday stemware to keep them looking their best - party after party. If your lead crystal glasses carry a dishwasher-safe label, you can pop them in along with your non-crystal glassware into the dishwasher. Riedel's Web site (www.riedelcrystal.com) notes that its lead crystal glasses are used in thousands of hotels and restaurants around the world and are, naturally, cleaned in professional dishwashers. Just make sure the long-stemmed glasses fit securely in the rack; don't overcrowd or overload. 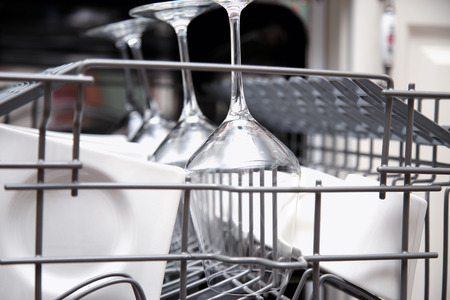 To prevent etching, use less detergent, buy the lowest phosphate-content brand you can find, and stop prewashing dishes. Dishwashing detergent needs a bit of soil to work, otherwise it will tend to foam up and attack surfaces such as glass and crystal, creating the cloudy appearance. Let glasses come to room temperature before starting the dishwasher. Extreme temperature changes - above 150 degrees Fahrenheit and below room temperature - can wreak havoc on crystal. Let the dishwasher cool before you open it after the washing cycle is complete. And allow the crystal glasses inside to air-dry before you touch them - the heat softens that lovely gold or platinum trim and could cause smudging. If your crystal glasses emerge from the dishwasher stuck together, don't try to pry them apart - they'll break. Instead, put cold water in one glass and about an inch of hot water in the other. Then gently separate the pair. Place vinegar in the bowls of cloudy crystal; allow to sit for five minutes. It's the easiest and safest way to remove a cloudy film. If that doesn't work, squeeze a soft scrub with bleach-type cleaner into the bowl of the glass and rub. Let sit for several hours with cleanser inside. CLR, a commercial product formulated to remove calcium, lime and rust buildup, also works well. To make old or cloudy crystal shine, mix baking powder (it's less abrasive than baking soda) with lemon juice or water into a paste. Rub over the crystal; rinse clean in lukewarm water. If the above don't get rid of the fog on your glasses, give Restaurant Crystal Clean: Professional Wine Glass Cleaner and Crystal Cleaning Liquid a go. It works great at reducing cloudiness and soap scum residue from glasses. If you haven't used your crystal glasses in a while, smell them before pouring in your fine Cabernet. Some finer crystal absorbs musty or woody odors from the cupboard. They will need cleaning before use. Remove your hand jewelry, swing the faucet away from the sink to prevent damage, and place a soft rubber pad over the bottom of the sink. If you have a divided sink, have a rubber cover over the ridge between sinks. Wash with lukewarm water, using a mild hand-washing detergent (more is not better here - excessive detergent can leave a cloudy residue). Add lemon peels to the rinse water for sparkle and shine. Before polishing your glasses, steam them over a pan of boiling water for an extra sparkle. And be sure to replace your drying towel if it becomes too damp - a wet linen towel will cling to the crystal and could cause the glass to break. To eliminate fingerprints from your crystal, wear gloves when drying by hand. And of course, you wouldn't force the cloth into the bowl of your crystal glasses; the delicate bowl will shatter under pressure. 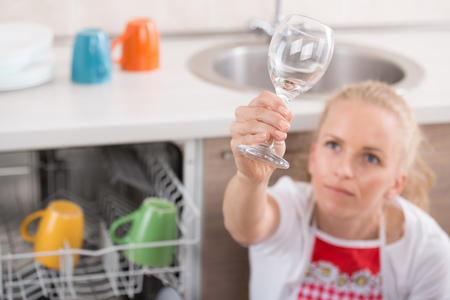 Finally, if you're a little lightheaded after a night of enjoying your wine glasses, you may be too clumsy to tackle this delicate chore before retiring for the evening. Just give the glasses a quick rinse and leave an inch or so of water in the bowl of the glasses. There's always tomorrow.